Nationality: American. Born: Ronald Walken, Queens, New York, 31 March 1943. Education: Attended Professional Children's School, Manhattan; Hofstra University, New York. Family: Married the actress Georgianne Thon, 1969. Career: Worked as a model starting at age three; early 1950s—appeared in countless live television productions mostly in walk-ons; 1960—Broadway debut in J. B. (billed as Ronny Walken); early to mid-1960s—stage performances, mostly in the chorus, include Best Foot Forward , High Spirits , Baker Street , and West Side Story ; first dramatic stage role in 1966, in The Lion in Winter ; 1969—film debut in Me and My Brother . Awards: Best Supporting Actor Academy Award, and Best Supporting Actor, New York Film Critics, for The Deer Hunter , 1978. Address: 142 Cedar Road, Wilton, CT 06897, U.S.A.
"Off the Wall with Walken," interview with Tinkerbelle, in Interview (New York), August 1977. "Talkin' with Walken," interview with V. Visser, in Interview (New York), February 1979. "Introducing Christopher Walken," interview with M. Whitman, in Films Illustrated (London), March 1979. "Out There on a Visit," interview with Gavin Smith, in Film Comment (New York), July/August 1992. Interview with Kurt Markus, in Interview (New York), July 1993. "Interview with the Antichrist," interview with M. Frankel, in Movieline (Escondido, California), December 1993. Maslin, Janet, "Movies 'Discover' Christopher Walken," in New York Times , 26 December 1978. Fox, T. C., "Christopher Walken: The Shy and Evil WASP," in Village Voice (New York), 15 January 1979. Hodenfield, C., "Point-Blank: The Deer Hunter 's Christopher Walken," in Rolling Stone (New York), 8 March 1979. Chase, D., and J. Coencas, " Deer Hunter Vets Step Out: Walken Embraces Acclaim," in Feature , April 1979. Kornbluth, J., "Christopher Walken: The Oscar Winner Nobody Knows," in Mademoiselle (New York), December 1980. Haller, Scot, "I Am the Malevolent WASP," in Esquire (New York), January 1981. Wolf, W., "The Walken Enigma," in New York , 15 June 1981. Norman, N., "Walken Tall," in Photoplay (London), July 1985. Gaillac-Morgue, "Christopher Walken," in Cinéma (Paris), 18–24 September 1985. Guerif, F., "Christopher Walken," in Revue Belge du Cinema (Brussels), May 1989. Katsahnias, I., "Christopher Walken," Cahiers du Cinéma (Paris), June 1990. Weinraub, Bernard, "A New York Actor Takes Stardom with a Grain of Salt," in New York Times , 24 June 1992. "Walken on the Wild Side," in New Yorker , 9 January 1995. Penman, I., "The Dead," in Sight & Sound (London), January 1997. Christopher Walken started acting as a child when he appeared in countless television and stage productions. Then, as an adult he enjoyed several years of popularity and critical acclaim on the Broadway stage. In the 1970s, he started working in film, and during the early years of his screen career Walken distinguished himself in several compelling supporting roles, including his amusing performance as Diane Keaton's strangely neurotic younger brother in Annie Hall , and as a cunning and comfortably kept gigolo in Roseland . Most notably, he appeared as The Deer Hunter 's Nick, a naive young man with romantic ideas about the adventures and heroism of war, who becomes emotionally broken, then embittered and suicidally detached as a result of his experience in Vietnam. After this still-memorable award-winning performance secured his formidable film reputation, his first leading screen role (and the first time he received top billing) was in The Dogs of War in 1980, the same year he appeared in the epic but commercially disastrous Western Heaven's Gate . One of America's most skillful and unique actors, Walken has amassed a huge list of screen credits and has carved a compelling and singular niche for himself in cinematic history. He has worked with both mainstream directors, such as Tim Burton, Mike Nichols, and Robert Redford, and with more unconventional directors, such as Abel Ferrara, Paul Schrader, and Quentin Tarantino. As deft at comedic as at dramatic performance, Walken is a strikingly complex film presence: supremely confident yet accessible, menacing yet vulnerable, and eccentric yet serious. His characters convey unmistakably askew, and occasionally deeply disturbed, psyches. Tall, thin, and almost-handsome, Walken has one of the most singular visages in contemporary American cinema. 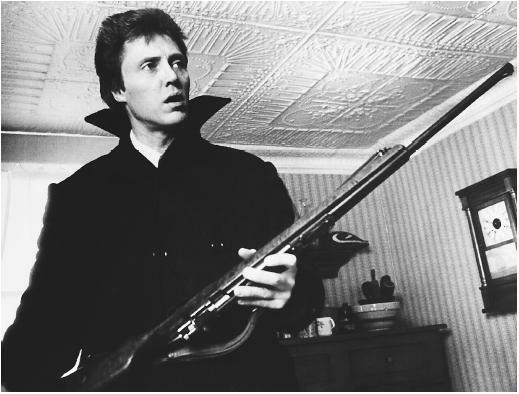 Moreover, his talent is multifaceted: along with his nimble physical style (the result of his many years as a stage dancer) which enables him to convey a delicacy and subtlety of bodily expression, Walken has an extraordinary command of his voice—including an unexpected emphasis on certain words and a rich repertoire of rhythms. His wide-ranging talents have been revealed in several remarkable roles, including At Close Range in which he offers a chilling performance as a sociopathic Midwestern hood who commands a gang of thieves and recruits his adrift teenaged sons—among his countless other criminal and moral offenses. In the thriller The Comfort of Strangers , he conveys a deep understanding of the powerful combination of scary and funny; his performance as a monstrous and crazed European stranger in murderous pursuit of a vacationing British couple is disturbing and intense, yet also immensely funny. As his film career has evolved over the years, Walken has altered his acting style, especially in terms of his emotional expressivity, in noteworthy ways. In his early film appearances, including The Deer Hunter and The Dead Zone , his performances were more overtly emotional. In his more recent roles, Walken's performances have tended to be less revealing and more stoic, thus lending an additional layer of complexity to his characterizations. In The Milagro Beanfield War , for example, he appears in only a few scenes as a taciturn troubleshooter working for a group of unethical businessmen and government officials. In a particularly compelling scene, Walken visits the office of a small-town lawyer and community activist where he calmly listens to the man's emotional tirade which is meant to be intimidating. Remaining calm, Walken responds by raising his eyebrow, muttering "mmmmm," and leaving—otherwise keeping his specific thoughts to himself, and thereby withholding the means by which to clearly interpret his interior state. Recently, Walken redeemed the otherwise weak film The Prophecy , in which he appears as the evil, manipulative, yet strangely amusing archangel Gabriel. Also, with a willingness to accept smaller film roles, Walken has an uncanny ability to deliver quite memorable performance. In Pennies from Heaven , for example Walken makes a brief appearance as a seamy but seductive and dancing pimp. More recently, as a military buddy of Bruce Willis's dead father in Pulp Fiction Walken is riveting—sober and commanding, even as the content of his monologue shifts from noble to amusingly outrageous. Walken has quite aptly described his screen persona: "I am the malevolent WASP." Indeed, he has achieved the American dream by playing an assortment of offbeat characters who typically represent a distortion of America's puritan ideals.